Hello fellow IMA. My apologies to you. Life is not easy. 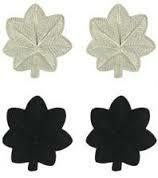 In the civilian world, you work hard, play office politics and with a little luck you might get promoted. Not so in the reserves. Here your promotion depends heavily on your ability to decode a bunch of Air Force personnel jargon and to make a lot of non-cooperative admin types take care of someone who they really don’t see as their responsibility. I hope my story helps you out. When is my PRF due? When does it have to be signed and where does it need to be delivered to? How do I review (and potentially change my records)? Before answering these questions I had to write my PRF. Why do IMAs write every word of their PRFs and OPRs? Because IMAs are always shafting their reserve boss because of the demands of our main job and the last thing we want to do is have someone go through the torture of the AF evaluation system when we’ve been so lame. so no probs here . . . because I’m on a shell with root I can use uudeview under linux to decode a xfdl into a zipped xml file and then extracted it to view in emacs. Happy to explain this in more detail if you email me at tim@theboohers.org for other questions, I recommend you call the total force service center at Comm 210-565-0102. What do non-hacker IMAs do? Ok so I can parse XML easily enough to get the following from here. The document to make sure you have in your hip pocket is AFI 36-2406 OFFICER AND ENLISTED EVALUATION SYSTEMS. It is probably the worst written document possible for quickly finding what you need, but it is the guide for how this is all supposed to work. According to ARPCM 15-17 CY16 ResAF Board Schedule my board meets on 13-18 Jun. I found this via myPers or https://gum-crm.csd.disa.mil/. 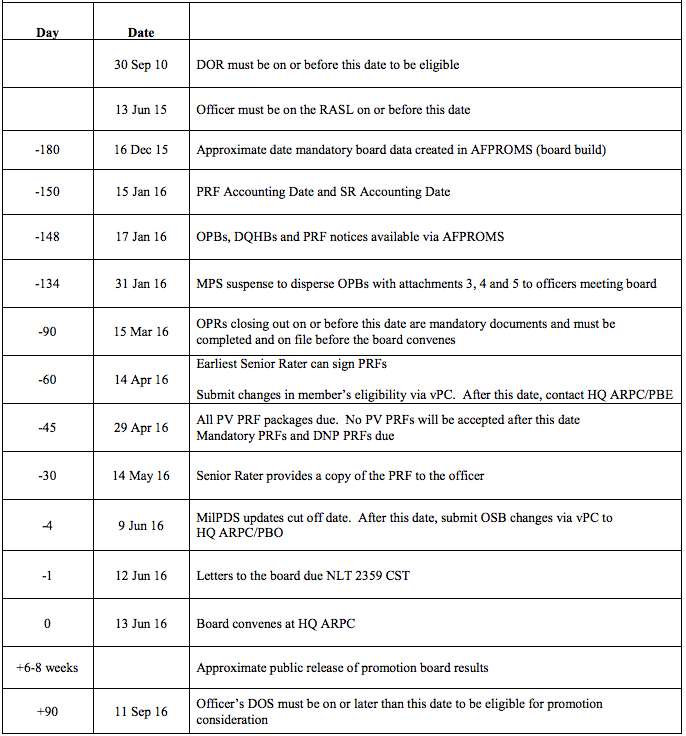 From 36-2406, I know then that an eligible officer’s senior rater completes the PRF no earlier than 60 days prior to the CSB: which for me is Thursday, April 14, 2016. From the table above, I see this confirmed that my senior rater (the USD(P)) has to sign the document between 14 Apr 16 and 29 Apr 16 and I get the completed document by 14 May 16. I can’t find how the PRF gets to the board, but I’m just going to bug the unit admin until I can confirm the document is in. Check your records on PRDA. So I was missing two OPRs and an MSM. Wow. The key here was working my network and finding the (amazing) admin at ARPC/DPT who had direct access to the records database and was able to update it for me before the board. This entry was posted in Career, USAF and tagged Life Experience, reserves. Bookmark the permalink. What was the most Geeky Event in History? Hey Tim! I stumbled across your blog looking for a quote I recalled about IMAs — somebody had it in a comment on one of your blog entries. I had remembered your name and face from when we were at AFRL together. Good luck on your upcoming board! I’m moving on from my AFRL IMA job having been promoted out of it, but I’m still there in my civilian job.